Great products and services for rail fans: If you have a train website and would like me to add you to the group, please let me know. 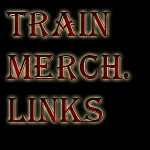 http://yardgoatimages.com >Great railroad videos from Yard Goat. http://www.revelationvideo.com/ > Ron offers DVDs and tapes of the best in railroading: yesterday and today. http://www.farrail.net/ > Train excursions around the world with Bernd Seiler. http://geoffs-trains.com/ > British specialist tour operator offering luxury train journeys, train holidays and heritage steam train tours. http://www.tanago.de/erlebnisreisen/en/home.php > Travel in Style and in small groups to enjoy some of the most interesting places for railfanning.